Many manufacturers are now combining traditional styles and materials with advanced technologies, delivering a product homeowners can love for years to come. Among all the options on the market, vinyl siding — with its various styles, textures, and colors — remains the most-used product. In fact, 2016 marked 22 straight years that vinyl siding held the top spot in cladding for new single-family houses, according to the U.S. Census Bureau’s annual home report. This material has come a long way since it was introduced in the 1950s, with manufacturers such as Ply Gem Building Products making strides in research and development efforts for design and performance. 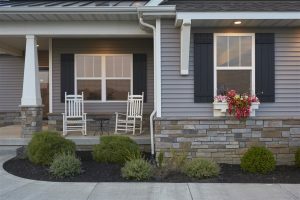 Whether you are building a new home or remodeling, there are four key considerations every homeowner should account for when determining which siding option will best meet his or her needs: durability, design, maintenance, and affordability. Siding selection is typically a once-in-a-lifetime decision, making durability a key factor for many. Homeowners should look for a siding option that is resistant to every element, including rain, wind and even the sun. Manufacturers now offer siding products with technologies that resist the damaging impact of the sun, preserving color for the lifetime of the home. Options, like Ply Gem’s Mastic Vinyl Siding SolarDefense Reflective Technology, expand exterior home design with darker, on-trend colors that can make your home the envy of the neighborhood. Today, the most overwhelming decision for many when considering siding options can be style and color — but it doesn’t need to be. There are several primary siding material options available to homeowners — vinyl, aluminum, steel, wood, brick, fiber cement, stucco and stone — and countless color and style options within each material type. To help you determine what might look best, seek the advice of a siding specialist like a contractor, builder or architect for help. They can educate you on color coordination and what would go well with the neighborhood, while still giving personalized options for your home. Also, check out online resources like Ply Gem’s home exterior visualizer to experiment with different options and customize your style. In fact, more than 400 vinyl siding colors have been certified for color retention, according to the Vinyl Siding Institute (VSI). The variety offers homeowners a virtually endless palette of fade-resistant colors, from pastels to deep hues, combined with trim, accents, and accessories. Look to manufacturers like Ply Gem that offer complementary solutions for the entire exterior.